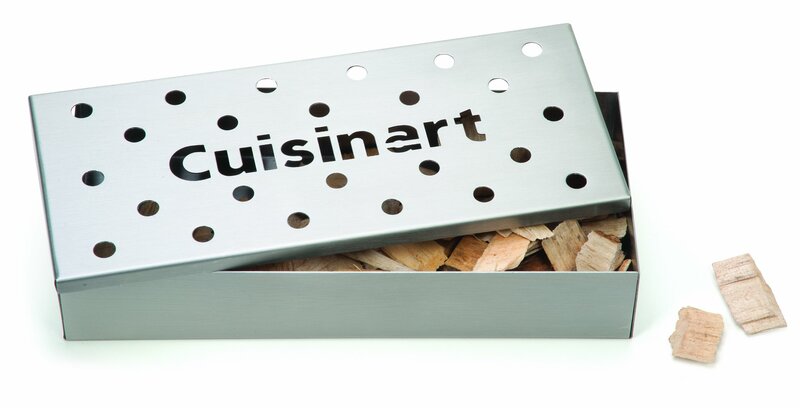 The Cuisinart Wood Chip Smoker Box infuses your barbecue with delicious smokyflavors just like the pros. Simply place a handful of pre-soaked cedar,hickory, mesquite or other wood chips in the stainless steel smoker box andplace the box on your gas or charcoal grill while cooking. In no time, yourgrill comes to life with aromas you thought only the professionals couldcreate. Your meat, fish and poultry capture the smoky flavor, turning yourbasic barbecue into delicious gourmet meals. What's best is that the compactsize takes up very little space on your grill, so the smoker box works greatwith any grill size. Innovative culinary tools are the Cuisinart signature.The prestigious Cuisinart brand is not limited to their famous food processors- plugged or unplugged, nobody covers the modern chef like Cuisinart.Cuisinart is a full-service culinary resource with a wide array of products,preferred by chefs and favored by consumers. And now you can take the worldfamous Cuisinart brand to your patio, lawn, tailgate, or campsite with theircomprehensive line of Cuisinart outdoor grilling products available now onAmazon.